Author(s): Guoqiang Zhang, Pierre-Olivier Esteve, Hang Gyeong Chin, Sriharsa Pradhan. New England Biolabs Inc., 240 County Road, Ipswich, MA 01938, USA. Mammalian DNA methyltransferases (DNMTs) establish and maintain DNA methylation patterns at specific regions of the nuclear DNA, resulting in modulation of gene expression. Amongst the DNMTs, the maintenance DNA methyltransferase, DNMT1 participates in faithful copying of parental DNA methylation patterns to daughter strands. In the past decade, it has become evident that an intricate web of pathways and accessory factors recruit DNMT1 to its target sites on DNA. This recruitment often alters the biological function by regulating gene expression. Here, we review the understanding of these regulatory and inhibition mechanisms, with a particular focus on RNAmediated inhibition of DNMT1. The pathways involved in DNMT transcripts interference by miRNA, post-transcriptional regulation by non-coding RNA, dynamic interaction of RNA with DNMTs, and the new role of noncoding RNA in targeting mammalian DNMTs are discussed. The analysis of RNA based inhibition or modulation of DNMT1 activity is imperative to the understanding of the role of DNA methylation inheritance and its influence in diseases, particularly cancer and future RNA based therapy. 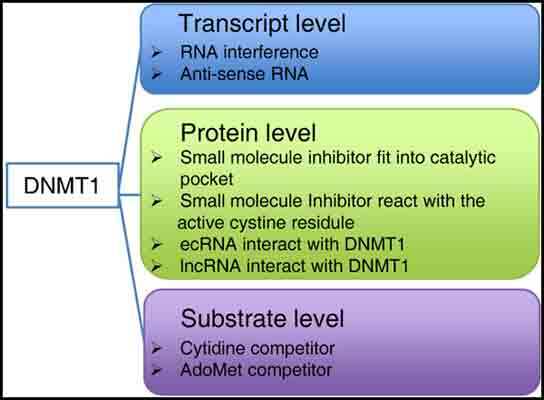 Keywords: DNMT, inhibition, RNA, therapy. Affiliation:New England Biolabs Inc., 240 County Road, Ipswich, MA 01938, USA. Abstract:Mammalian DNA methyltransferases (DNMTs) establish and maintain DNA methylation patterns at specific regions of the nuclear DNA, resulting in modulation of gene expression. Amongst the DNMTs, the maintenance DNA methyltransferase, DNMT1 participates in faithful copying of parental DNA methylation patterns to daughter strands. In the past decade, it has become evident that an intricate web of pathways and accessory factors recruit DNMT1 to its target sites on DNA. This recruitment often alters the biological function by regulating gene expression. Here, we review the understanding of these regulatory and inhibition mechanisms, with a particular focus on RNAmediated inhibition of DNMT1. The pathways involved in DNMT transcripts interference by miRNA, post-transcriptional regulation by non-coding RNA, dynamic interaction of RNA with DNMTs, and the new role of noncoding RNA in targeting mammalian DNMTs are discussed. The analysis of RNA based inhibition or modulation of DNMT1 activity is imperative to the understanding of the role of DNA methylation inheritance and its influence in diseases, particularly cancer and future RNA based therapy.